Whenever I am working on something, be it homework or one of my various tasks for Bodhi I almost always have the TV on in the background. I have a lot of work that I do - so that amounts to a good deal of television hours. Even with this being the case though, I have not watched more than a few hours of network television in the last three years. A few years back I took a spare PC I had laying around and turned it into a dedicated media PC. It runs pretty much 24/7 attached to my 32" LCD television. Most people don't sit right on top of their television and I am no exception to this rule. Thus in order to control my media PC I needed some form of wireless control. For a good deal of the last three years I've struggled with using a Logitech wireless keyboard and mouse. While these generally worked they chewed through batteries, had poor wireless range and other various issues. I must say after having used this little device for a couple of weeks I am fairly impressed with it. The range on the device is fantastic - I can go anywhere in my front room and get a flawless signal to my PC. The keyboard is of good build quality and the raised keys make for a pleasant typing experience. The dimensions of the keyboard are slightly bigger than your average smart phone keyboard - meaning that anyone who can text fairly quickly will have no problem working with this keyboard at an impressive speed. While the product page claims the device is only compatible with various flavors of MS Windows - I have had absolutely no issues with the device on my Linux media PC which runs a build of the 3.0 kernel (meaning it should work on most all modern Linux distros). Beyond being a useful toy at home, I also plan to drag my remote along with me once I start teaching classes so I can work the PC I am presenting from anywhere in the room. Finally, the price tag on this little guy is 80 USD. So while this is more expensive than your average wired keyboard and mouse it is about the same cost as most quality wireless keyboard and mouse combos. 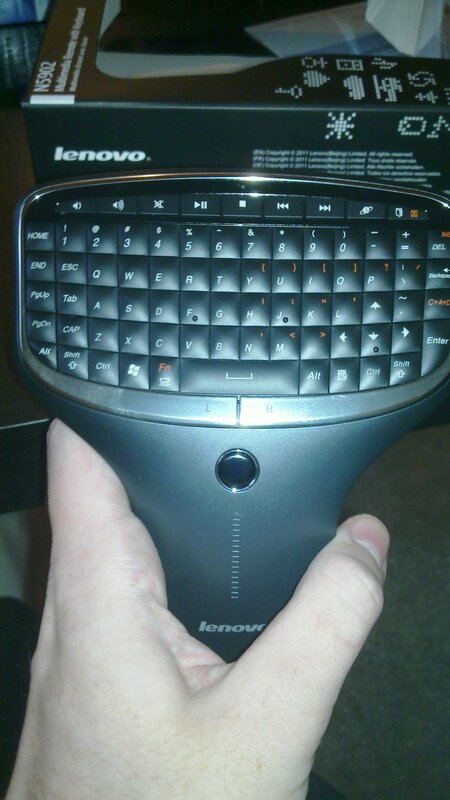 In similar situations we have used the keypad-equipped Keysonic USB keyboard and a similar 'Point' device. Sorry, can't find the model numbers. We gave away all our wireless keyboards/meese/joysticks years ago. Just too frustrating to use at that time. Love the idea of a good trackball, but for $80 we could get 3 of the 'Point' devices, so will have to wait a bit for the price of the elegant Lenovo to erode with time.